This is a one-shot collaboration work by two long-time friends and mangaka. The story is about Kinya, who is on the run from the Japanese mafia, after a failed murder attempt on the yakuza boss. Together with him are his brother, Takuzou and his girlfriend, Aya. But, things are not as simple when they have some… extra baggage along. The story talks about a "gang" that seemed to be given a job to kill certain man that looked like a boss of something to me. The main character has the chance of killing the target but fails... If i say more I might spoil the story, hahaha. Well overall it had me quite intrigued! Genuinely from the artist of Death Note, the art is stunning, detailed, awesome over all... BUT the story to me was quite lacking and dissatisfying. It is a one shot though, never worthless to give it a try. Extremely original! You won't find a manga with the same plot anywhere! A story of misunderstandings, betrayal, confidence, and misconceptions, you won't be able to tear yourself away! The art is gorgeous, and the characters have much appeal, fashion and real life situations fit to a, 'T.' This manga is particularly amazing for it's detail and amazing attention to characters regardless on how short the piece may have been. Though you're only familiar with this band of teenagers for one chapter, you find yourself instantly connected and have feelings for all of them. You'll scream at their mistakes and find yourself exclaiming, "Why? Whyyy?!" Be prepared to bite your lip and keep your heartbeat in check, cause this is going to be a bumpy ride. The plot was original and kept my attention throughout. The characters were interesting and realistic. It's a one shot so there was only room the flesh out 3 of them, but they're well done. 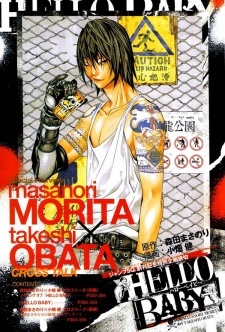 The art is really good, just what you would expect out of Takeshi Obata. From the cover art I thought that the main character's mechanical arm would fit in to the story somehow, but it was completely ignored. Yup, the "extra baggage" that the synopsis is referring to is something completely different. It's a 49-page one shot with some good art, so I'd recommend it if you have a few minutes to kill. This one shot was created by two people, the art from Obata, Takeshi (Death Note, Hikaru no Go, Bakuman), and the story from Morita, Masanori (Rookies). Which I thought was pretty cool and so I decided to read it. I don't know any words that can describe this one shot but it sure was a ride. The art was absolutely beautiful and the story was really a tragic of betrayal. I don't know about you guys, but I really enjoyed reading this one shot. The characters in here weren't really revealed nor developed, but it had the potential of becoming a series. So overall, I gave it a 8/10.